The new 2012 Mustang specs have been released even as the paint continues to dry on the 2011 Ford Mustang. There are some exciting specification and styling package changes and some minor, but important improvements. Plus there are a host of new options and special styling and performance packages. As expected by many, the 2012 Ford Mustang is an evolutionary change, rather than a revolutionary one, in the case of the Mustang GT below. And that's probably a really good thing, as Ford has demonstrated from the continual improvement of the new Mustang since it was introduced as a 2005 Model. The bigger changes, are reserved for the Boss 302 and Boss Laguna Seca packages. Changes in the exterior are minor, ( see the 2012 Mustang GT section) except for those that directly relate to the Boss 302 . Ford has deleted the Sterling Gray Metallic, which I think is too boring for a car like this. They've also added a new Lava Red Metallic (UZ) and exclusively to the Boss, is a new Competition Orange (CY). I recently had a chance to see the 2012 Boss 302 in Vancouver BC (where the 2010 Olympics were held) and I have to say, it looked even better up close. Check the link for full details and new pictures. Here's a great alternative to a new GT500 or GT350 Shelby Mustang. It's the new 2012 Shelby GTS Package, designed to be retrofitted to 2011 and 2012 Mustangs. And if you're the proud owner of a 300 plus horsepower 2011 or 2012 Mustang V6 car, you can get in on the fun. Check out the full details and specs on the 2012 Shelby GTS Package . Continued for the 2012 V6 Model, is the Mustang Club of America Special Edition, which includes unique striping and logo, rear decklid spoiler, painted dark stainless billet grille, front mounter lower front fascia (bumper) fog lights and Automatic headlamps. The V6 pony package, comes with polished aluminum wheels, and a unique grille, fog lamps, Pony badging and unique tape stripe. The 2012 California Special package will continue to be available, with a chrome billet grille and body colored surround, unique lower fascia with headlamps and a rear spoiler and fascia splitter. You'll also find special 19" painted wheels, door panel "Carbon" inserts, along with leather seats also sporting a "carbon" insert treatment. As a matter of fact, a look over the list of available wheel options, shows that there is a grand total of 13 different wheels available, depending on engine and styling packages. The Mustang will continue to be offered as both a coupe (fastback) and a convertible. Changes to the interior are relatively minor as well, save for the addition the new "Lava Red Interior" option, which includes lava red door inserts, and leather seat inserts. There are also some minor changes to the door trim, headliner and A pillars, which will see a darker charcoal finish. Also as part of the 2012 Mustang specs, is a Recaro sport seats, which adds cloth lined Recaro sport seats, along with a TORSEN helical differential, housing a 3.73:1 gear, the same as you'll find in the Boss 302 and Laguna Seca. Here's more details, specs and pictures of the new 2012 Ford Mustang GT. 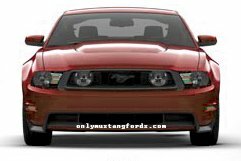 Check out the newly released 2012 Mustang 5.0 liter GT cars , including the 2012 Mustang specs for the GT models, as well as new pictures of the modern hot rod pony car in and out. Ford has taken a bit longer with the release of this model, thanks to offering cash incentives to clear out the 2011 models. The 2012 Mustang specs for the 5.0 liter Coyote engine, pumps out 412 horsepower at 6,500 rpm and 377 pounds of torque at 4,250 rpm (down 10 hp from 2011), while the Boss 302 models receive an upgrade to 444 horsepower and 380 pounds of torque. And let's not forget that great new (and finally powerful) V6 engine. No longer do you have to suffer a horsepower drought just to get some decent fuel economy. With Ford's new high revving 3.7 liter V6, you get 305 horsepower at 6,500 rpm and 280 lbs of torque. Not only that, but with less weight on the front end, this car is lighter and some say, a much better handling car. On the new Boss side, one little tidbit I found interesting, is that Ford has gone old skool with it's specifications. No I don't mean rating engines at gross horsepower. They are referring to the Boss engine in their literature as the "HiPo" which Classic pony car fans will recognize as the term for the original 1965 Mustang K Code engine, as specially prepped 271 horsepower, high revving engine, which these days, can cost almost as much as a car by itself! Fuel economy for the 2012 Mustang GT is rated at 18 mpg city/25mpg highway with the 6 speed automatic, or 17 mpg city and 26 mpg for the automatic six speed transmission. The new Boss 302 and Laguna Seca, is rated as 17 mpg city/26 mpg highway. Full information, as well as pictures and specs are found for the 2012 Boss 302 and 2012 Boss Laguna Seca in their respective sections. Curb weight for the Ford Mustang GT models is 3,453lbs for the coupe, 3,586 for the convertible and for the Boss 302 models a slightly higher 3,631 lbs. If the new Boss 302 just isn't powerful enough, there's only one choice. You'll want to check out the new 2012 Shelby GT500 specs. It's a whole lot of supercharged fun! The V6 2012 Mustang specs continue to provide the power of the new in 2011 model 305 horsepower engine, along with its fabulous 19 mpg city/31 mpg highway fuel economy (mpg) for the six speed manual transmission cars. 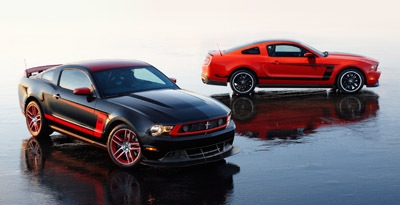 The V6 Performance Package continues, and you could be the one to rename it for the 2012 Mustang. Check out the Facebook Mustang V6 Performance Package Contest for more details. New, this year, is a selectable effort power steering system (EPAS), with settings for normal, comfort and sport. Like the 2011 incarnation, Shelby and Ford have teamed up to create another limited production GT500, with upgraded specifications and features. 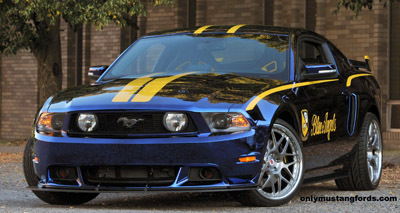 Here's the full story and pictures on the new 2012 Shelby GT500. Check out this link to learn the winner and new name and what's in the 2012 Mustang specs for the V6 performance package. If you've always dreamed of a one of a kind Ford Mustang, than there's nothing as rare as the 2012 Blue Angels Mustang, created in celebration of 100 years of Naval Aviation and of course, the Blue Angels squadron. This rare bird was built specifically as a one-off car for auction, with the proceeds aimed directly at the EAA Young Eagles program. 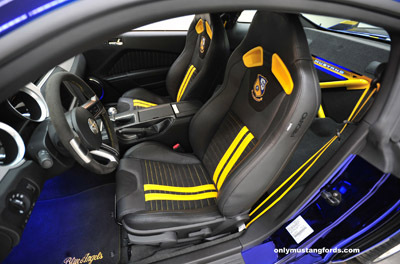 The 2012 Mustang features some redesigned elements directly from the amazing 2012 Boss 302 and Shelby GT500, such as the specially fitted Recaro seats, emblazoned with the Blue Angels logo. Looking where the back seat should be and you'll find the Boss Laguna Seca style seat delete crossmember, decked out in a nice yellow paint, matching the seat detail and exterior stripe treatment. Ford Racing had a go at it too, including the top quality suspension package and check out these 2012 Mustang specs. A not so mild 5.0 liter Mustang Coyote engine, pumping out 500 horsepower. Definitely NOT a show car! Ford has returned with a new and improved 2012 Cobra Jet pony car, set up and ready to race at the race track of your choice, if you're one of the fortunate able to grab one. Here's the specs and improvements to the 2012 Cobra Jet. There are a total of five different warranties for the new 2012 Ford. Plus a roadside assistance program included for 5 years and up to 60,000 miles. Something to remember when you take your next trip to the auto club to renew. Find out what else is new in the overall 2012 Mustang Specs in the 2012 Mustang order guide. And if your tastes run to the 2012 Cobra Jet, check out the 2012 cobra jet order guide. Did you know that there was a Boss 302 Canadian connection ? Check out how this Canadian company was instrumental in the Boss 302R and the Boss 302 development. Want to see the new Boss Mustang in action? You can access the 2012 Boss 302 video from here, or on the 2012 Boss 302 page. There's a limited edition, dealer installed add-on for the Mustang Boss, called the Boss 302 Track Key which creates a virtual Jekyll/Hyde metamorphosis under the hood, turning the already crazy Ford Coyote 5.0 engine and chassis tuning into a snarling, lumpy idling race rocket! Here's another great way to vicariously check out the awesome new Boss on the road and the background on how it was developed from the powerful, but standard 2012 Mustang specs into the car you see today. The 2012 Boss 302 on Speed Channel video. 2013 Mustang Specs - Pictures and More! Here's the latest information, pictures and specs on the newly announced 2013 Ford Mustang, which made it's debut at SEMA 2011. Click on the blue link and jump to the 2013 Ford Mustang section. There's also a huge amount of hot off the press information and of course, specifications and pictures on the 2013 Boss 302 Mustang. And if your taste runs more to the 5.0 liter V8 Coyote powered GT cars, you'll find all you need in the 2013 Mustang GT section.